BRCA1 and BRCA2 are known to cause Hereditary Breast and Ovarian Cancer (HBOC) Syndrome. For over 20 years, Myriad has been dedicated to understanding mutations in these genes as well as reducing the overall variant of uncertain significance rate to ensure that all patients receive answers. Increasing knowledge over the last several years about these genes has changed medical management and now mutations in BRCA1 and BRCA2 genes are used to inform patients' management related to the PARP inhibitors Lynparza™ (olaparib) and Zejula™(niraparib).2,3. BRACAnalysis CDx® is an in vitro diagnostic device intended for the qualitative detection and classification of variants in the protein coding regions and intron/exon boundaries of the BRCA1 and BRCA2 genes using genomic DNA obtained from whole blood specimens collected in EDTA. Single nucleotide variants and small insertions and deletions (indels) are identified by polymerase chain reaction (PCR) and Sanger sequencing. Large deletions and duplications in BRCA1 and BRCA2 are detected using multiplex PCR. Results of the test are used as an aid in identifying ovarian cancer patients with deleterious or suspected deleterious germline BRCA variants, who are or may become eligible for treatment with Lynparza™ (olaparib). 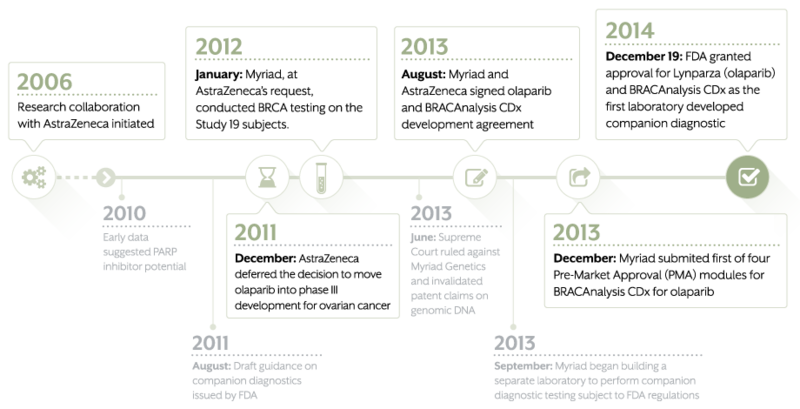 Detection of deleterious or suspected deleterious germline BRCA variants by the BRACAnalysis CDx test in ovarian cancer patients is also associated with enhanced progression-free survival (PFS) from Zejula™ (niraparib) maintenance therapy. This assay is for professional use only and is to be performed only at 320 Wakara Way, Salt Lake City, UT 84108.